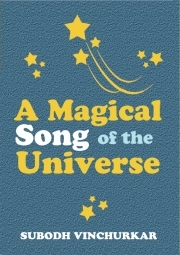 Description of "A Magical Song of the Universe (eBook)"
Written as an engaging story of Mr. Tops and his three sons, this fun book unlocks intelligence and opens up a life of joy and success. Mr. Tops has opened 'Song of the Universe' for his sons. Now, strange events have begun to unfold in their house. Events that promise to unlock their intelligence and help them discover inner freedom and joy. The author has been a keen observer of human mind and life. He has been exploring deep mysteries of human life and mind for over a decade. By education, he is an engineer and a management graduate from IIM Bangalore. During observation of hidden workings of mind and life, Subodh discovered that several hidden tendencies of human mind prevent human beings from realizing their full potential. As a founder of AwakenYourIntelligence.org, Subodh now dedicates his full time to conduct intelligence workshops for children and adults. If well received, these workshops can help participants unlock hidden intelligence, inner freedom and joy. A Magical Song of the Universe – A book that can unlock hidden intelligence, inner freedom and joy in children of all ages. Reviews of "A Magical Song of the Universe (eBook)"